With one quarter left to go in 2018, there are three things on investors' minds: the Fed, the coming mid-term elections, and the ongoing trade war. Thus far, the market has mostly shrugged off these concerns, though income-focused investments such as bonds, REITs and dividend-paying stocks have had a hard time gaining traction. Sizemore Capital's Dividend Growth portfolio, which invests primarily in higher-yielding securities, has also had a hard time gaining traction in 2018. The portfolio returned 0.14% in the third quarter and 0.53% in the year-to-date through September 30. This compares to 7.2% in the third quarter and 9.0% year-to-date for the S&P 500 and 5.1% and 1.6% for the S&P 500 Value. (Returns data calculated from the performance of Sizemore Capital's Dividend Growth model at Interactive Brokers; past performance is no guarantee of future results). Given its focus on attractively priced stocks paying above-market dividend yields, I consider the S&P 500 Value to be a more accurate benchmark than the standard S&P 500. And frankly, it's been a difficult market for value strategies. Over time, value strategies have proven to outperform. This is not my opinion. This is empirical fact. In their landmark 1993 paper, University of Chicago professors Eugene Fama and Kenneth French found that value stocks outperform over time. More recent research by BlackRock found that in the 90 years through 2017, value has outperformed growth by a full 4.8% per year. But while value trounces growth over time, 90 years is a long time to wait. And there are stretches - sometimes long stretches - where value underperforms badly. We're in one of those stretches today. Figure 1 illustrates this in vivid detail. The graph shows the ratio of the Russell 1000 Value index divided by the Russell 1000 Growth index. When the line is declining, growth is outperforming value. When the line is rising, value is outperforming growth. Value massively outperformed growth from 2000 to 2007, but it has struggled ever since. This has been particularly true over the past two years as the "FAANG" stocks - Facebook (NASDAQ:FB), Amazon (NASDAQ:AMZN), Apple (NASDAQ:AAPL), Netflix (NASDAQ:NFLX) and Google (NASDAQ:GOOG) (NASDAQ:GOOGL) (Alphabet) - have completely dominated the investing narrative. I would love to tell you the exact date when the market will flip and value will start to dominate again. For all I know, by the time you read this, it might have already happened. Or that day might still be years away. That's not something I can control. But I can stay disciplined and focus on high-quality companies that I believe to be temporarily underpriced. And because my strategy has a strong income component, we don't necessarily need prices to rise in order for us to realize a respectable return. The average dividend yield of the stocks in the Dividend Growth portfolio is 5.65% at time of writing (This yield will change over time as the composition of the portfolio changes). As we start the fourth quarter, I am particularly bullish about some of our newer additions, such as Macquarie Infrastructure Company (NYSE:MIC) and Ares Capital (NASDAQ:ARCC). Macquarie Infrastructure lowered its dividend earlier this year, which led investors to dump it in a panic. The shares dropped by over 40%, giving us a very attractive entry point. Ares Capital, like many BDCs, has found the past decade to be difficult. But after a long, six-year drought, the company raised its dividend in September, and I expect further dividend hikes to come. At current prices, the shares yield a whopping 9.0%. I also continue to see value in some of our long-held energy infrastructure assets, such as Energy Transfer Equity (ETE) and Enterprise Products Partners (NYSE:EPD). Energy Transfer, in particular, is attractive due to its planned merger with is related company Energy Transfer Partners (ETP). I believe this could be the first step to an eventual conversion from an MLP to a traditional C-corporation, which would potentially lower ETE's cost of capital and allow for greater ownership by mutual funds, institutional investors and retirement plans like IRAs. CEO Kelcy Warren has indicated that this is the direction he ultimately wants to go. I see the greatest risk in the portfolio coming from our positions in automakers General Motors (NYSE:GM), Ford Motor Company (NYSE:F) and Toyota (NYSE:TM). I consider all three to be wildly attractive at current valuations, but all are also at risk to fallout from the escalating trade war. As a precaution, I lowered our exposure to the sector earlier this year by selling shares of Volkswagen (OTCPK:VLKAF). But given the potential for a rally in the shares following a favorable resolution to the trade war, I feel it makes sense to hold our remaining auto positions and potentially add new money to them on any additional pullbacks. The Federal Reserve raised rates again in September, which was widely expected. But it was a subtle change to its statement that raised some eyebrows. It dropped the language saying that its policy "remained accommodative." Does this mean that the Fed believes easy money is already over and that it's not much more tightening to be done? Or does it mean that it's about to get even more hawkish? The statement was ambiguous. But it is noteworthy that the Fed is still forecasting another hike before the end of the year and three more in 2019. And Powell's statements following the official statement suggest that he's eager to continue draining liquidity out of the market. There are limits to how aggressive the Fed can be here. If it follows through with raising rates as aggressively as it plans, it will push short-term rates above longer-term rates, inverting the yield curve. I don't see the Fed risking that, as an inverted yield curve is generally viewed as a prelude to a recession. 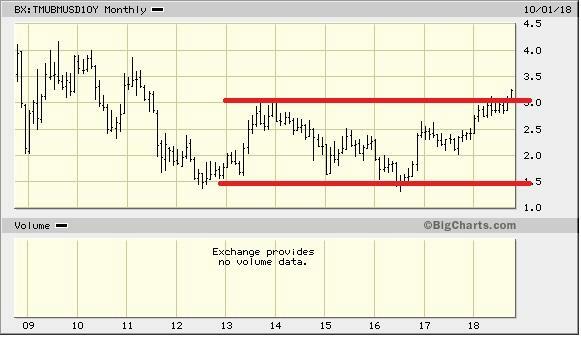 Meanwhile, bond yields have finally pushed through the long trading range of the past six years. The 10-year Treasury yield broke above 3.2%, a level it hasn't seen since 2011. I do not expect yields to rise much above current levels, as I do not see such a move justified by current inflation rates or growth expectations. But this is something I am watching, because the Dividend Growth portfolio, given its yield-focused strategy, is sensitive to changes in bond yields. Looking forward to a strong finish to the year. Disclaimer: This article is for informational purposes only and should not be considered specific investment advice or as a solicitation to buy or sell any securities. Sizemore Capital personnel and clients will often have an interest in the securities mentioned. There is risk in any investment in traded securities, and all Sizemore Capital investment strategies have the possibility of loss. Past performance is no guarantee of future results.